There are many ways to connect to your love ones. 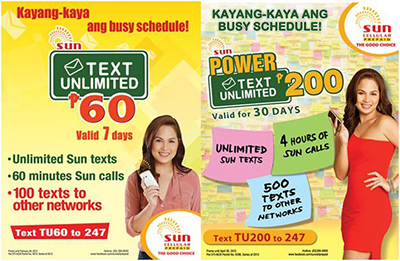 Sun Cellular offers Sun Prepaid Text Unlimited promos. With Sun Text Unlimited, you can send unlimited SMS to SUN subscribers. On top of it, Sun Text Unlimited includes minutes to call and additional text to other networks. Visit www.suncellular.com.ph for more details and get the latest updates. WHY DOES THE TU150 HAVE SOME INCONSISTENCY? I UNDERSTAND IT IS SUPPOSED TO GIVE UNLI TEXT AND 240 MIN. CALL SUN-TO-SUN FOR 30 DAYS. BUT SOMETIMES IT SAYS 7 DYAS. WHY IS WHICH> IT LOOKS SO DECIEVING. by agents now. It is undeniable that sportswear plays an important role in an athlete. Can I extend TA15 like other network ? Like tm tnt ? 5 pesos only? ?